Hello from NYC!! I’m here in the city for an exciting event that I’ll share more about on Monday! In the mean time, we did a live yesterday when I was getting ready and chatted about our favorite makeup products with my sisters, Emily and Amy, and my makeup artist, Ashley. As promised I’ve done a round up of all the products we chatted about! Let me know if you ladies have any questions about any of the products or how I use them!! Loved watchIng the live with you and your sisters yesteRday! What eye Palette did Ashley use on you? Your makeup looked absokutkey gorgoeus ? Do you use loving tan on your face as well? If not what Self tanner do you recommend for face? What was the lipstick she used on you? I love charlotte tilbury all her products are amazing! Thanks for the post. Do you personally use that speci curling wand as well? Do you personal use thIs speci curlIng iRon as well? Really enjoyed your live feed the other day! Does the Loving Tan wash off that same day or Is it more like self tanner that builds? Hi Cindy! 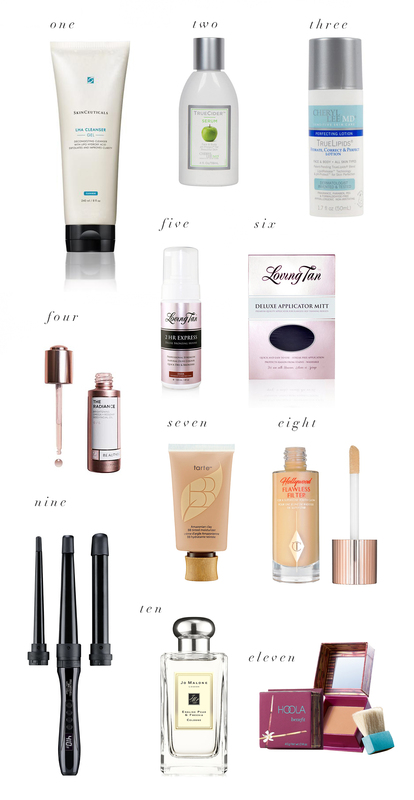 Loving Tan is buildable! I recommend exfoliating first, then moisturize any dry areas and apply self tanner in circular motion. It does wash off but not right away or easily so it’ll last a few hours. your IG live posts were so great. I’d love it if you dug out that photo and share it of you jumping on the trampoline in the yellow dress! a throwback would be so fun. If you had to pick one out of the first 3 on your post, which one would you pick?